Tiger Roll is unlikely to go for an unprecedented third successive Grand National win at Aintree next year, according to owner Michael O'Leary. On Saturday, the nine-year-old gelding became the first horse since Red Rum 45 years earlier to claim back-to-back victories. Red Rum claimed a record third win in 1977 but no runner in the race's 180-year history has won three in a row. "I feel no pressure to go back and try to win a third time," said O'Leary. "Tiger Roll isn't Red Rum - he's Tiger Roll." The Ryanair chief has said his target next season would again be the Cross Country Chase at the Cheltenham Festival and Tiger Roll could be retired if he wins, meaning the horse would bow out after a fifth victory at jump racing's big March fixture. 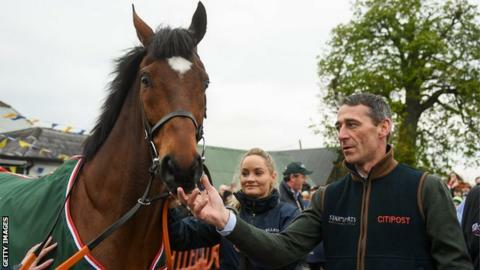 However, O'Leary's comments have been met with scepticism as he had warned Tiger Roll would not go to Aintree this year after winning at Cheltenham last month. Where did your horse finish the National? Sent off the 4-1 favourite on Saturday, the horse, ridden by Davy Russell and trained by Gordon Elliott, was the shortest-priced winner since Poethlyn 100 years ago, seeing off runner-up Magic Of Light by just under three lengths despite carrying 6lb more in weight than last year. O'Leary, who owns the horse through the Gigginstown House Stud operation he runs with his brother, knows he would almost certainly be made top weight in 2020 for the handicap chase, which would mean another 5lb to carry. Tiger Roll has looked an even better horse this year, and the way he travelled so sweetly in the National had some observers suggesting he should run in next year's Cheltenham Gold Cup. "We are not tempted by the Gold Cup - he is a small horse, the Gold Cup is such an attritional race," said O'Leary. "He has won four times at Cheltenham, and if he were to go back and win five times at Cheltenham - what more do you want from the horse? I think at that stage I would mind every precious hair in his body." O'Leary flew back to Dublin on Saturday night with Elliott and Russell among the passengers on one of his aviation firm's planes and he treated passengers to two free drinks each. On Sunday, the horse was paraded through the village of Summerhill, County Meath - near to where he is trained - and a crowd of about 2,000 people gathered for the homecoming. Tiger Roll is the fifth back-to-back winner in 172 runnings of the race. Before Red Rum, it was last achieved by Reynoldstown just before the Second World War. Elliott, who won his first National in 2007, is the first trainer to saddle three winners since Tim Forster with Well To Do (1972), Ben Nevis (1980) and Last Suspect (1985). It was a joint record third win - all in the last four years - for Tiger Roll's owners Gigginstown House Stud, which is headed by Michael O'Leary and his brother Eddie. Their first victory came with Rule The World in 2016. Tiger Roll was really bred to race on the flat, rather than over jumps - as a son of Authorized, the 2007 Derby winner at Epsom. He has won four times at the Cheltenham Festival - in the Triumph Hurdle, National Hunt Chase and Cross Country Chase (twice). Tiger Roll's dam (mum) was Swiss Roll, a horse trained by Tommy Stack - the man who rode Red Rum to his historic third National victory.